As Australian manufacturing companies compete with growing overseas markets, traditional methods of producing and conveying parts through various manufacturing steps are coming under close scrutiny. Being lean and smarter are two ways to become more competitive. “We have been looking at smarter manufacturing designs for our clients and the Lean principles help with those designs,” said Chris Emmins, a director of Process Finishing Solutions, a company specialising in designing and installing finishing systems. “Existing finishing equipment is often found to be oversized, over-powered, aged or ill equipped to handle reduced volumes, new parts configuration and multiple colour changes,” he said. This is counter to the accepted lean manufacturing concept that aims to reduce idle time – one of the eight lean wastes – between manufacturing processes, as they shorten the point of order-to-delivery time for a particular product. Lean manufacturing also aims to reduce the amount of finished stocks held and to only manufacture and coat the part at the “pull” of the customer. Lean also aims at pursuing an economical batch size of one. “This means that batch sizes are reducing as manufacturers start applying lean techniques,” said Emmins. By contrast, infra-red (IR) ovens can reduce energy consumption by up to 90 per cent compared to convection ovens and can also decrease curing times by 80 per cent. Emmins first looked at infra-red heating 20 years ago when he walked past a catalytic gas emitter at a trade show. “I couldn’t believe the heat energy coming out of this emitter, and it didn’t even look hot,” he said. He has since started producing his own range of infra-red ovens under the QuickCAT brand name. These ovens utilise explosion-proof, catalytic gas and infra-red emitters. The long wave length of the emitter coincides with the absorption range of organic coatings resulting in up to 95 per cent of the infra-red energy being absorbed by the coating. Sensitive substrates can also be passed through infra-red ovens because only the coated part surface is targeted, affecting a cure without the mass of the part reaching the curing temperature. A new approach is needed for finishing these varying batch sizes with multiple colour and texture choices to address the needs of lean enterprises. Recently, a number of finishing lines have been installed to do this. The lines are powered with catalytic gas infra-red ovens and overhead track shuttles with manual and powered conveyor systems. “We have just started our involvement with the NikoTrack conveyor systems in Australia,” said Emmins. “The versatility of this product is amazing and the ideas and layouts you can design is endless. You can just make things happen at competitive prices. Systems can work for a one-man show or a large multi-national, and the layouts can be scaled to grow as the client grows without starting again. “Some have innovative loading and unloading sections where the track disengages and lowers. This enables safe work practices and eliminates interaction between forklifts and operators, while manipulating heavy components. “The advantages of these lines over traditional lines are lower capital investment, smaller plant footprint, long part capability, lower running costs and increased production throughput,” he said. The lines also achieve all the lean goals and will aid in driving manufacturing costs down. 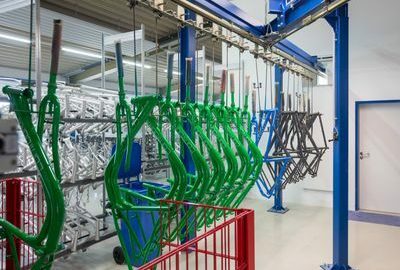 The production flexibility of coating various batch sizes, while requiring multiple colour changes, is achievable using NikoTrack design. Operating with this degree of flexibility using an energy efficient, low carbon-emitting curing system, is achieved with the use of QuickCAT IR technology. While this may not apply to all coating scenarios, a growing number of manufacturers and coaters are turning to these systems to meet different and new economic challenges of finishing parts and components – for example, extra-long structures, multi-racked components or medium-density fibreboard (MDF) – while getting lean at the same time.